The artist places herself as a stand in for African American victims of police brutality, violence and humiliation. Unlike the victims and their families, the artist controls which images are shared and how. She can delete information: background, people. She can alter color, scale, orientation. 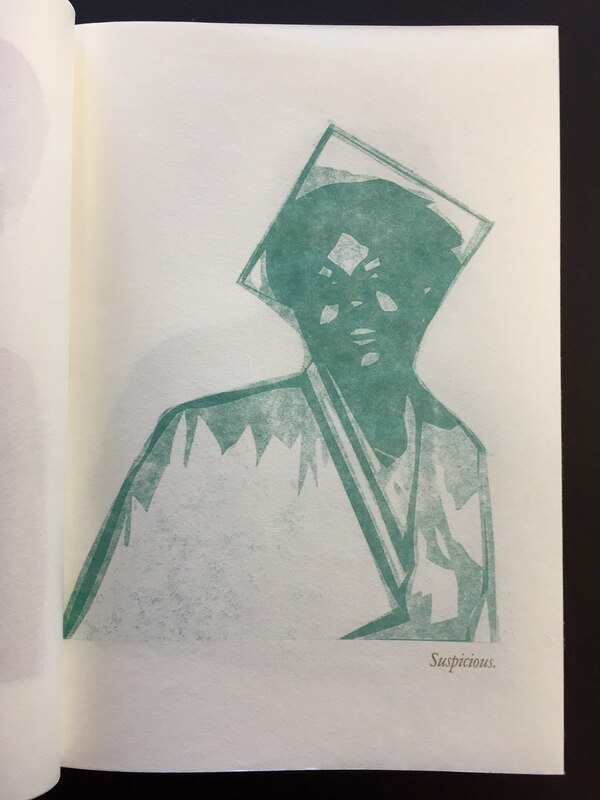 Accompanying letterpress text serves as captions and shows how incredible racial profiling and post-mortem media portrayals of African American victims. Personal and family photographs as well as those that the artist shared on social media were digital manipulated, then hand cut and assembled as paper matrices. With each photograph and subsequent turn of the page, I AM represents both the abrupt end of a person’s life. A baby will never be the toddler standing unsteady with her hand patting an ottoman as her father watches television in the background. The toddler does not spend her tenth summer swimming in the pool and making friends at camp. And so on. Containing pressure prints with handset letterpress on kozo and lokta papers, I AM is stab bound in an edition of 25 copies.